Why not buy your groom some beautiful wedding cufflinks? Looking for a special gift for your groom to wear on your wedding day? The look no further than our Wedding Cufflinks. These are designed and made in the Britain by the award-winning Chez Bec from the finest freshwater pearls and Swarovski crystals and can be made in any colour of your choice. Why not give them to all of the groomsmen, the best man and father of the bride. Our wedding cufflinks would make a truly special keepsake. 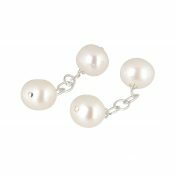 View basket “Freshwater Pearl Cufflinks” has been added to your basket.